At the end of the previous part you had a working application, but it did not do much. All user interaction consisted of a click on a single button. This part will add more functionality. Note: please consider supporting the author of this site by purchasing one of my books! Thank you! Right now the argument you are passing into the say command is fixed. 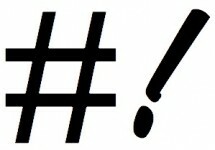 It would be better to have a field where the user can enter arbitrary text that will be passed to the command. In the file sidebar, select the ‘MainMenu.xib’ file and then move the ‘Talk’ button to the top right corner of the ‘SayThis’ window. As you move the button around the window blue lines will appear to guide you to the proper distances of the edges. Use these blue lines. Their alignments will help you later. Next, use the object library in the lower right of the Xcode window to find a ‘Text Field’ object. Drag the text field to your ‘SayThis’ window. Use the blue guide lines to align it in the top right corner and then extend it to the right until the blue lines show you it is right distance from the button. You could now build the app and see the text field is there. You can even enter text. However, clicking the ‘Talk’ button will still only say “hello world” since you have not changed the code yet. In your code you need to get the text from the text field. For that you need some reference to the text field object in the window. Create this ‘outlet’ the same way you hooked up the button action. First make sure you have a two part Xcode window. If you have closed the second pane, you can get it back by clicking the ‘Assistant Editor’ button in the top right window tool bar. And then choosing the ‘AppController’ file for the second pane. Then drag while holding the ctrl-key or with the secondary (right) mouse button from the text field to the code in the second pane. A blue line will appear to show the connection and a label ‘Insert Outlet or Action’ will show you what will happen and where. Let go of the drag below the line @IBOutlet weak var window: NSWindow!. Then a small panel will appear asking for a name for the outlet connection. Enter sayThisTextField. Enter the name, but leave everything else. @IBOutlet weak var sayThisTextField: NSTextField! In code terms this is a property of the AppController class. The @IBOutlet label tells Xcode that this property can be connected to a UI element, same as the @IBAction for the talk method. But this does not only create the proper code in the class to declare the property. The xib file also stores the instructions that this property will be set with the proper reference when the application loads. Same as the window property above which was part of the default template. Either way you look at it, you can now use the sayThisTextField property to get data from the text field. Leave the remainder of the method as it is. Build and run the application, then enter some english text in the text field and click the ‘Talk’ button. 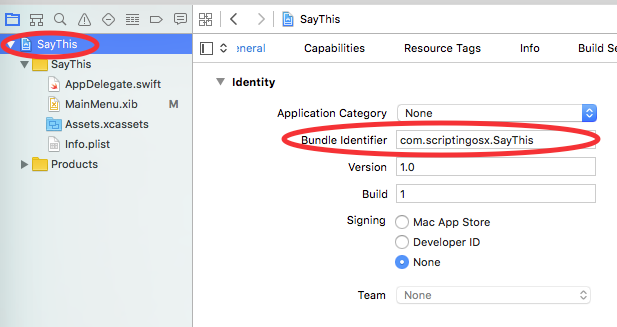 To do this, select the ‘Talk’ button (1), then make sure the ‘Attributes Inspector’ tab is selected on the right side of the Xcode window (2). Among the button attributes is one called ‘Key Equivalent’. Select the field next to this label and hit the return key. It should show the return icon as the key equivalent and turn the ‘Talk’ button blue. Now you can just enter text and hit the return key to activate the ‘Talk’ button and thus our action. When you build and run our application you can resize the window, but the text field and the button just stay where they are. This is not the right behavior. You can set re-sizing behavior in Xcode. Once again you need to ctrl or right drag from the object, but this time just drag towards the edge of the window which contains the object. The panel that pops up will then have options on how you want to ‘pin’ the object in the enclosing container. In the movie, normal clicks are shown as black circles and ctrl or right clicks are shown as blue circles. You need to drag from the talk button to the right margin and upper margin. Then from the text field to the upper margin and left margin. Finally drag from the text field to the button and fix that distance as well. When you then rebuild, then button and text field will react as you expect. You can inspect and change or delete the constraints for an object by clicking on the ruler icon in the Inspector pane on the right of the Xcode window. You can also click the constraint lines in the interface directly but they are small and hard to hit with the mouse. Setting up the constraints manually is powerful, but tedious and error-prone. You can also let Xcode suggest constraints. To do this select an object and choose “Editor > Resolve Auto Layout Issues > Reset to Suggested Constraints” from the menu. This will use the blue guide lines as the default constraints which is why it is important that you use them when placing objects. You can choose to reset the constraints of the selected object(s) or all objects (views) in a window. This will overwrite all constraints you may have set manually! The de-activation of the talk button from in the previous part still works. But it would be nice to have some indication that the system is working on something, especially on longer texts. Use the object library to add an “Indeterminate Circular Progress Indicatior” to your window. Place it above the right end of the text field and use the “Reset to Suggested Constraints” menu to set up the re-sizing behavior. Then disable the “Display when Stopped” behavior in the attributes inspektor. To give the progress indicator the instructions to start and stop the animation you need to hook it up to our AppController class. ctrl- or right-drag from the progress indicator to the AppController class to insert a new @IBOutlet and name it sayProgress. The progress indicator object has actions named startAnimation and stopAnimation. So you can tell them to take that action. Just like your talk action method you have to pass one parameter indicating the sender. When using other objects’ actions you would usually give self to pass a reference to the calling object. Note that you use the sender parameter to address the talk button. Since the talk button is the only UI element that can is hooked up to send the talk action this is safe to do. You can also hook up the talk button as an @IBOutlet and address it directly that way. 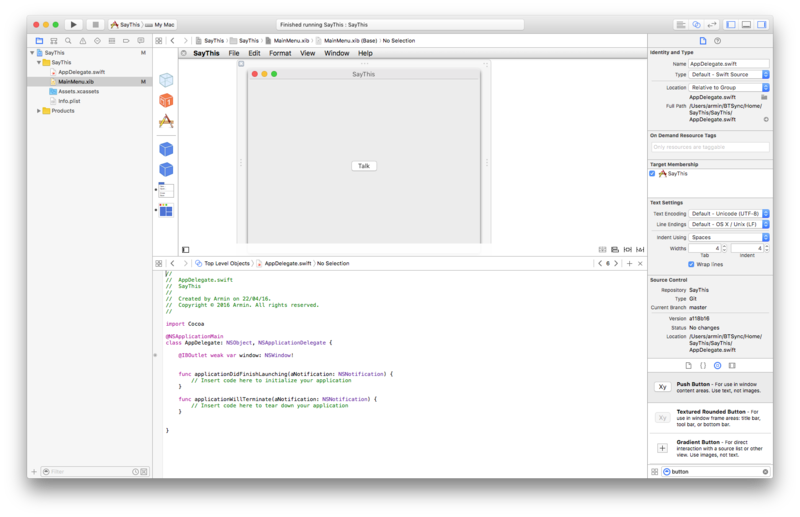 Note: in the Xcode split view you can hover over the grey circles next to the @IB... labels and Xcode will indicate the objects this action or outlet is hooked up to. If an outlet or action is not hooked up then the grey circle will be empty. The default OS X text to speech voice is called ‘Alex’, but there are many more. 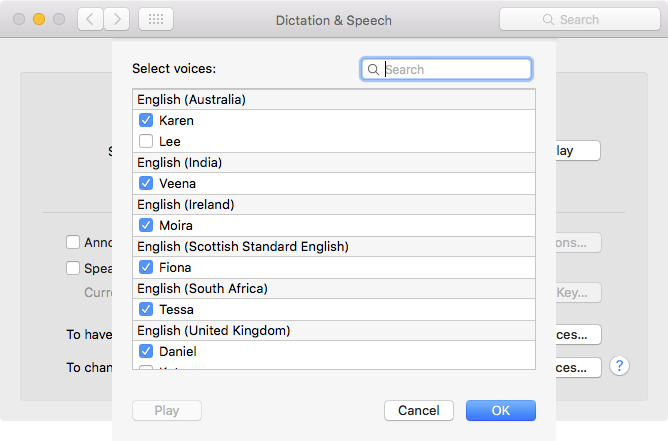 You can configure the avilable voices in the “Dictation & Speech” pane in System Preferences. When you click on the popup next to System Voice and then select “Customize” you can choose voices for different languages. Note that the download for the enhanced voices can be quite large. say -v Allison "hello world"
To give the user an option to choose from a list of voices, search for “popup” in the Object Library and drag the normal Pop Up Button to your SayThis Window. Also search for “label” and drag a label next to it. Change the Label to show “Voice:” and align both with other items and the blue guides. Set the suggest constraints. Next create an @IBOutlet for the popup button, call it voicePopup. Now, you can double click the popup button to edit its contents. There are three defaults and you can add more by dragging a “menu item” from the object library on to the popup button. Then you need to add to the talk method to get the information from the popup button and pass it into the task. First you have to change the arguments assignment to var, since you might change it later. Then you get the titleOfSelectedItem property from the voicePopup However, this is an ‘optional’, which means the value may be nothing. Swift requires you to deal with optional values, so you use a ‘conditional assignment’: if let voice =... This construct means “ if voicePopup.titleOfSelectedItem has a value, assign it to voice and do the following”. If there is a value from the popup, then append it to the arguments array. (Thankfully the say command does not care about order of the options.) Otherwise it adds no arguments and uses the default voice, which you set in System Preferences. Every time to quit and restart the app the setting on the voice popup reverts to the first item. There may be use cases where this is appropriate. However, often you want to store settings between application launches. The class to use for that called NSUserDefaults. However, this is such a common task, that you do not even need to write code. Select the popup button and then click on the square spiral icon to show the Bindings Inspector. Click the triangle next to ‘Selected Value’ to expose the settings for that. Check “Bind to” and make sure “Shared User Defaults Controller” is selected in this popup. Leave ‘values’ in the controller key field and enter ‘voice’ as the model key path. With this configuration, the popup button to “binds” its selected value to the key ‘voice’ of the property ‘value’ of the ‘Shared User Defaults Controller’. This binding goes both ways, the popup button will read its initial state when starting the application from there and will write it back to there when the user changes it. Re-build and launch the application, change the voice, quit and re-launch. The setting will persist. But instead of com.scriptingosx.SayThis use the full bundle identifier you entered when creating the project in the first part. If you do not remember what you chose, you can select the blue ‘SayThis’ project icon in the left side file selector to see all you project information. defaults write com.scriptingosx.SayThis voice "Karen"
Then re-launch the application and it will have preset the popup to “Karen”. Note: preferences stored this way can be managed with custom configuration profiles. This is a simple task but a nice project to find your way around Xcode and Swift. We will build a small Cocoa application in Xcode that executes a shell command on the click of a button. 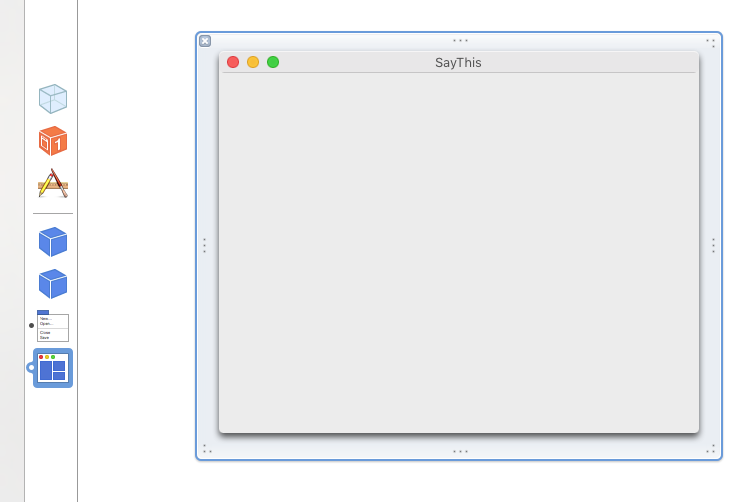 For this example we will use the say command which use OS X’s text to speech to say a given text. You can try this by opening the Terminal and typing say "Hello world". 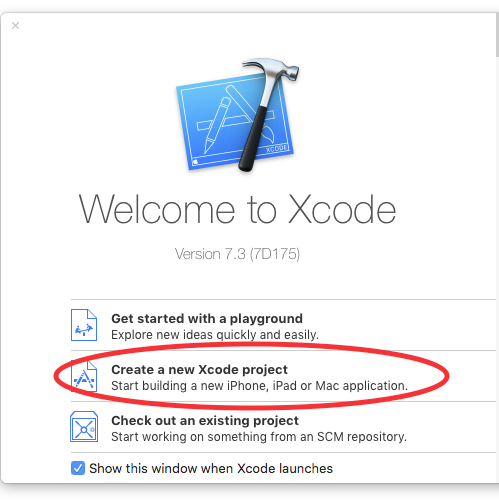 This tutorial is for Xcode 7.3 with OS X 10.11.4 El Capitan. It will probably not change too much with minor version changes, but no promises for major version differences. All you need is a Mac with 10.11.4+ El Capitan and Xcode 7.3+ which you can download for free in the Mac App Store or Apple’s Developer page (free registration with any Apple ID required). Once you have downloaded and installed Xcode, launch it. It may prompt you for some extra installations and a password on first launch. Acknowledge those and you get to a splash screen with a few options. If you have used Xcode before it will list your previous projects. But for now, select “Create a new Xcode Project”. On the next step Xcode suggests many templates to build your application from. 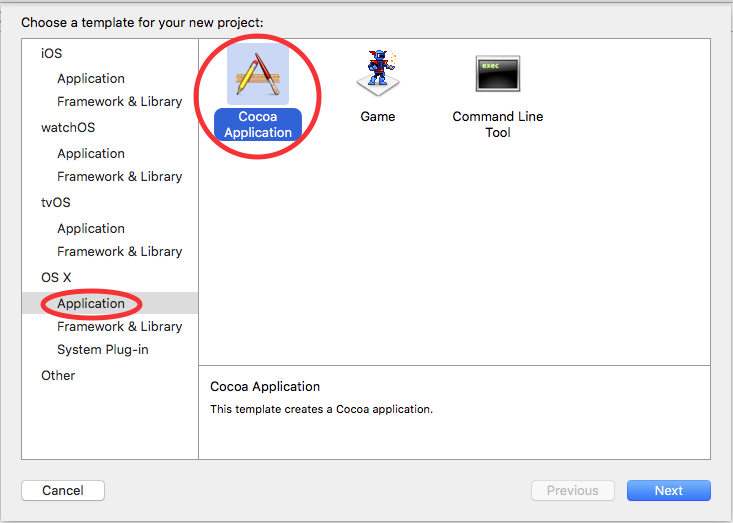 Select “Application” under “OS X” and then the “Cocoa Application” icon. Then click next to continue. In the next step you will have to fill in some identification for your applications. For the “ProductName” or the name of the application enter “SayThis”. Fill your name or organization name into the next field. The identifier in the third field should follow a “reverse DNS schema” for your organization. It is ok to use more than two segments, like “com.example.department”. If you don’t really know what to put in here use your email or github account in reverse order, i.e. “com.gmail.username” or “com.github.username”. 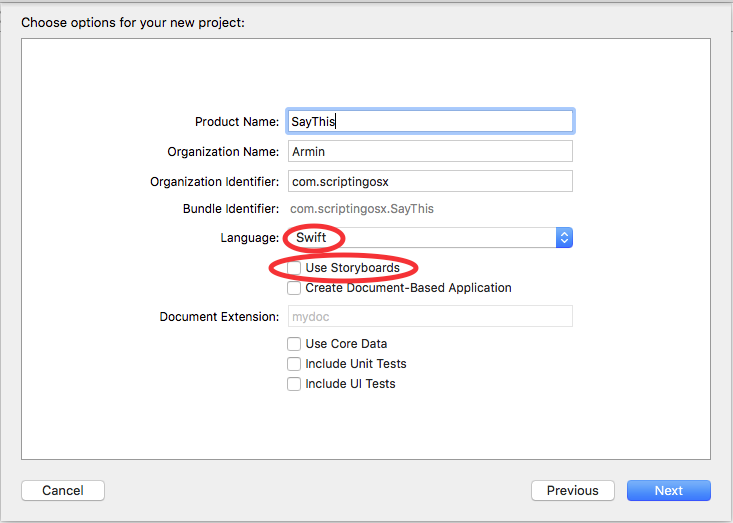 For the language select Swift and disable “Use Storyboards” and every other checkbox here. Our first application is going to be very simple. Finally, Xcode will ask you where to save the project. 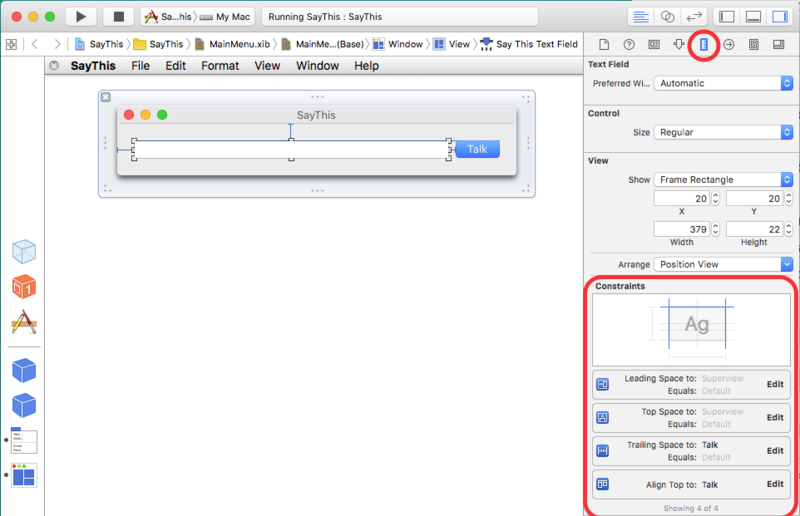 Xcode will create a folder named “SayThis” with all the necessary files. If you want, you can make the project folder a local git repository for version control. 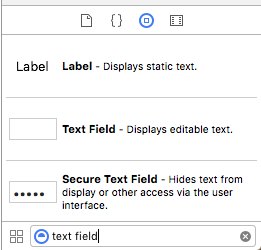 The Xcode window has a navigation area or file selector on the left, a main editor area in the center and an utility or information panel on the right. There are buttons in top right toolbar to show and hide the left and right panels. Right now the project itself is selected in the navigation area and the center editor shows various properties of the project. These were already set to useful defaults when the template was setup. There are four files in this particular template. Select “MainMenu.xib”. xib files store how the interface looks like. The editor will change to a graphical area to design the interface. The application’s menu bar is at the top. However, there is no window to put an interface visible. There is a list of icons, next to the navigation bar, representing various objects in this xib file. The lowest is a window. Click the icon to make the window visible in the editor area. 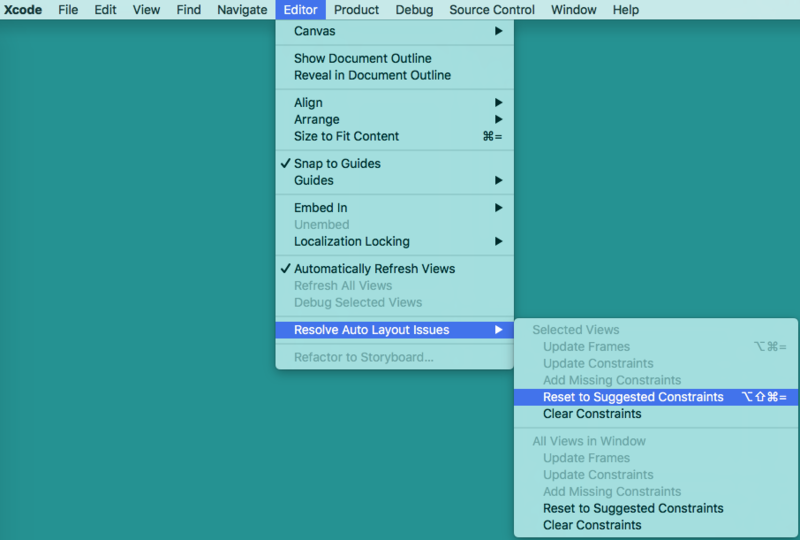 In the lower right corner of the Xcode window is a list of objects that can be added to the interface. You may have to select the circle icon with a square in it to see it. You can scroll through the list, but there are so many objects that it is easier to use the search field at the very bottom. Enter ‘button’ in the search then drag the “Push Button” to your window. As you drag the button around the window, you will see blue lines appear, guiding the button to the right center line or the right distance from the edges of the window. Use the blue guide lines to drop the button in the center of the window. You can double-click the text on the button to change the default label. Let’s use “Talk”. At this time you can already “Build and Run” the project. There is a “Play” triangle button in the upper right area of the window or you can choose “Run” from the project menu. Since this is the first time to build this project it will take a bit longer. Xcode will launch the application after building and it should show the window with the “Talk” button. You can click the button, however aside from the standard click animation, nothing will happen, since we haven’t told the button to do anything yet. To connect the button to some action, we need to connect it to some code. We need to show the code and the UI side-by-side. 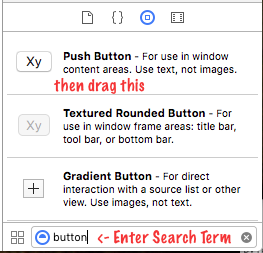 There is a toolbar button on the right with two blue circles, click that and choose “Assistant Editors on Bottom” or “…on Right” (your choice) to open a second editor pane. The template filled the AppDelegate.swift file with some code and one property that is connected to the window. We want perform an action method in the AppDelegate when the button it clicked. To make this connection hold the ctrl-key and drag from the button to the empty space in the AppDelegate below the two template function, but above the final closing brace }. When you end the drag there a small dialog will pop up asking for specific settings. Set it to be an action, name it talk and set the sender type to NSButton. This inserts an empty action method into the AppDelegate class. 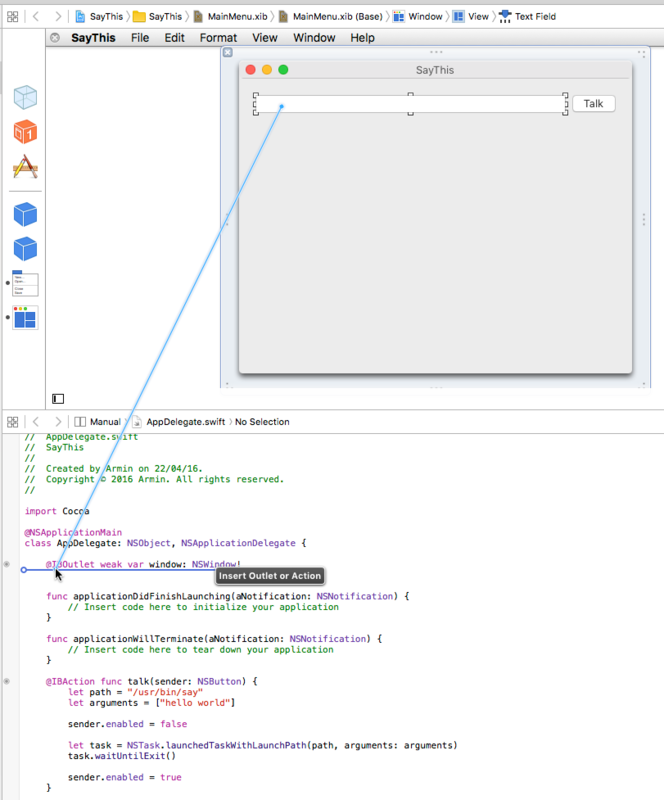 The @IBAction is a label for the interface builder part of Xcode to know this function is available to connect to the UI. func designates this as a function, but since this is within the definition of the AppDelegate class it is actually a class method of AppDelegate. In the brackets we define one parameter, labelled sender of type NSButton. The curly braces enclose the function code which is still empty. While you are typing Xcode will suggest completions for the code that you are typing. This can be very helpful and helps you avoid typing errors. You can hit the tab-key to accept the suggestion. The let statement is very particular to Swift and declares a variable as constant. The alternative label var would tell the compiler that we plan to change the content of the variable later. Choosing let and var properly will allow the compiler to optimize the resulting code. For example in this specific case, the compiler will use a non-mutable string and array class for our arguments, since they will not change later in the code. If you replace let with var and build then the compiler will notice you are not modifying the variable and place a warning that you should use let instead. Since the say command will not run within a shell and we cannot rely on environment variables being set, especially the PATH variable, we need to give the full path to the say command. To figure out the full path to a command you can use the which command in Terminal. Finally we use the NSTask class to create and launch the command. Then the waitUntilExit() method of NSTask pauses code execution until the command finished. Before we execute the task, we disable the button, then enable it later. Now, when you click the button it will be disabled while the task is running and be re-enabled afterwards. Congratulations! You have built a simple OS X Application. In the next part, we will hook up a few more UI Elements to give the app some more functionality.